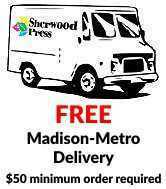 Sherwood Press offers digital and walk-in service. Email or Upload Your Files! Sherwood Press can give your project that final polish! We are pleased to be able to offer you a variety of book binding options. We have on-site bindery services. The final step of the printing process will finish your materials to make them eye-catching and functional. With years of experience under their belts, our in-house design team has been helping the clients of Sherwood Press say "awesome!" for years. Fueled on the latest graphic design toys and tricks, we aim to please.